President Vladimir Putin has announced a change of Russian policy in Syria after disclosing it to the Israeli Prime Minister Benjamin Netanyahu when they met in Paris on November 11. Netanyahu has reported in Israel that what Putin said was “very important”. With Netanyahu, Putin was not accompanied by Russian officials and the interpreter was an Israeli. Putin’s spokesman Dmitry Peskov said the meeting was a “short talk”, but gave no other detail. The Kremlin website did not report it at all. The Kremlin press office refuses to clarify why Putin and Netanyahu met with only Netanyahu’s interpreter present. 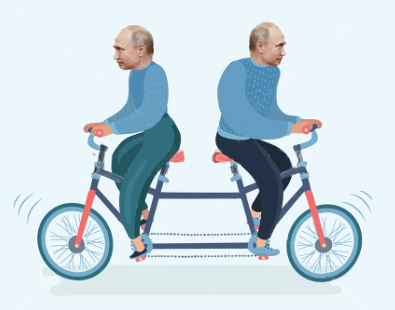 The next day, on the president’s return to Moscow, the Kremlin website reported that Putin informed the members of the Security Council “about several of his brief meetings on the sidelines of the events in Paris”. The Defence Minister Sergei Shoigu, Foreign Minister Sergei Lavrov and other senior officials had not accompanied Putin to Paris, so the Monday meeting was their first opportunity to hear what had been said. In Paris on November 11, left to right: President Vladimir Putin, Israeli interpreter, and Prime Minister Benjamin Netanyahu. The presence of the interpreter signals that Putin was speaking in Russian to make substantive points, not small talk in which he is able to speak in English with Netanyahu, who is fluent in English. Photo: https://www.jpost.com/ The Kremlin press office has been asked to identify the interpreter; it refuses. Putin’s report of what had been discussed with Netanyahu was published on the Kremlin website; in Tass and RIA-Novosti; and published by Vzglyad. No Russian commentaries have followed in the press. 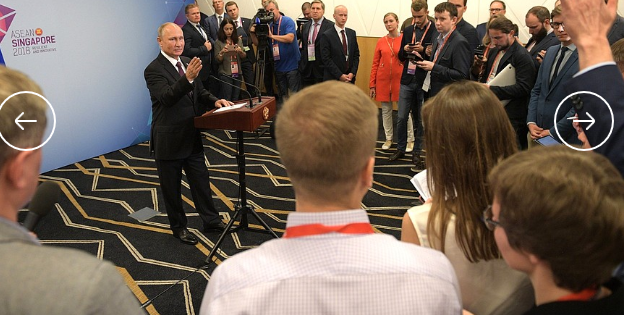 Accompanying Putin in Singapore were his spokesman Peskov; foreign affairs advisor Yury Ushakov; and Maxim Oreshkin, Minister of Economic Development. Again, as in Paris, Shoigu and Lavrov were not with Putin. Their absence, particularly Shoigu’s, is significant because Putin’s report of what he had discussed with Netanyahu reveals that Putin had returned to the interpretation he had given after the downing of the Ilyushin-20 during an Israeli attack on Syria on September 17; all fifteen Russian crew on the electronic surveillance plane were killed. Putin’s interpretation was explicitly dismissed by Shoigu and the Defence Ministry – with strategic consequences for Israel. Putin’s first response to the loss of the Il-20 had been to hold the Israelis harmless and to describe what had happened as a “tragedy”. “When people die, especially in such unfortunate circumstances,” Putin said at a Kremlin press conference the next day, “it is always a tragedy”. For details of the Israeli attack and the Russian reaction, click to read this and this. Taking Israel’s side, Putin had tried to dissemble, concealing the conflict with his ministers and the General Staff. He did not call his Security Council into session for a consensus discussion; he also avoided meeting Shoigu and Lavrov. The outcome was the Stavka’s initiative — implementation by Russia of a no-fly zone for fresh Israel Air Force attacks on Syria at the range of the combination of Russian and Syrian S-300 and S-400 missile batteries. Together, their defensive and missile interception range is more than 400 kilometres. 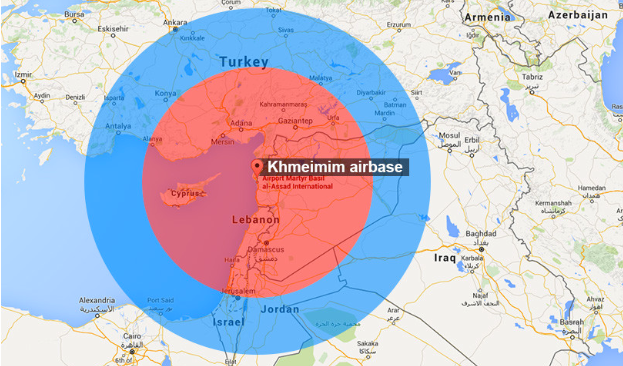 This Russian no-fly zone transformed Israeli’s freedom of military operations in the region; the effect was not only to stop them against Syrian targets, but also over Lebanon. It also transformed US aerial operations in and out of Iraq, Jordan and the Al-Tanf base in southeastern Syria. The Stavka’s move announced by Shoigu was an unprecedented shift in the balance of power in the region. By meeting Netanyahu in Paris, Putin was able to sidestep the Stavka, and give Netanyahu what he was asking for. Putin gave him the assurance that Russian air defences in Syria will not enforce a no-fly zone for the Israel Air Force so long as it sticks to Syrian and Iranian targets and promises not to repeat its ambush of the Il-20.